Antoine Vermette (Ducks) – After being bought out by the Coyotes in early August, Vermette signed a two-year, $3.5MM contract with their division rivals, the Anaheim Ducks. Radim Vrbata (Coyotes) – The former Coyote returned to the desert after a two year stint in Vancouver, where he had one very good year (31 goals and 63 points) and one very poor year (13 goals and 27 points). Vrbata signed for one season at $1MM, with a possible total of $3.25MM including performance bonuses. Matt Cullen (Penguins) – The defending Stanley Cup Champions re-signed Cullen to a one-year, $1MM contract. Despite the cheap signing, the Penguins are still $3.9MM over the $73MM salary cap. Sean Monahan (Flames) – The restricted free agent center signed a seven-year, $44.625MM contract. The Flames now have $8.6MM of cap space to sign their leading scorer Johnny Gaudreau. John Gilmour (Rangers) – The Rangers made an early splash in the college free agent market, which would soon be overshadowed. Gilmour, the Flames seventh round pick in 2013, posted 65 points in 141 games at Providence College. Pro Hockey Rumor’s third ranked college free agent signed for two seasons worth $1.85MM. Thomas DiPauli (Penguins) – The Penguins signed PHR’s second ranked college free agent to a two-year, $1.85MM entry-level contract. DiPauli was Capitals fourth round pick in 2012, and posted 78 points in 145 games with the University of Notre Dame Fighting Irish. 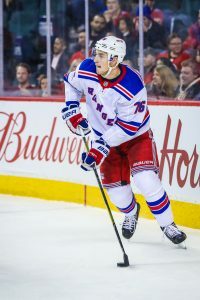 Jimmy Vesey (Rangers) – By far the highest sought-after college free agent, Vesey surprised many and signed with the Rangers. The subject of much speculation this summer, Vesey was the Predators third round pick back in 2012 but was traded to Buffalo this spring when it was clear he wasn’t going to sign. Vesey is expected to step straight into the NHL and produce at a second or third line rate. Logan Brown (Senators) – In non-college free agent news, the Senators signed their 11th overall pick to a three-year, $4.9MM entry-level contract. The 6’6, 220 lb center has 117 points in 115 career OHL games.